The rally featured an array of speakers calling for a new day in the nation’s care of its people. Trade union leaders, health care activists, patients and physicians all took a turn at the microphone to relate their experiences and call on Congress to act now. The labor movement played a key role in organizing the event, and signs carried by many participants identified them as union members. In addition, when labor leaders spoke, they made clear that the movement was representing all workers, organized and otherwise, in the struggle for universal health care. 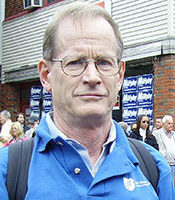 Wendell Potter, former private insurance company representative and now an advocate for universal health care, warned the crowd of the dangers of “Wall Street-run health care.” He went on to say, “I really am encouraged today by what I see across the country; we are on the verge. The next few weeks will be among the most important in our country’s history.” He said he saw “deep and sincere support for the public option” in both houses of Congress. 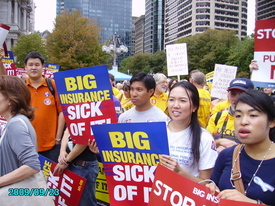 After the rally, the crowd marched three blocks to the headquarters of CIGNA, identified as one of the main offenders in denying claims and refusing coverage. Chants of “Health care now!” and “CIGNA shame!” filled the street as motorists honked their horns and signaled their support.